I have some orange Zinnias very similar to your, I love how you’ve used them and I’ll try to grow more next year. I think I prefer the second vase you’ve used, although both are lovely. Thanks Christina. My zinnias are from a mix and I feel lucky there are so many oranges this year. Sometimes they’re heavily weighted toward pink. I think the proportions fit the second vase better also. The first vase felt too bulbous or something, although I love the shape of the vase on its own. Cathy, the dahlias are about 2 inches so they’re very small compared to what I was expecting! The zinnia packet has a great balance this year, some very strong yellow, plenty of orange (which I love) and a wide variety of apricot, pinks, magenta; only a few red and a few whites. Some years they are heavily weighted toward pinks. Such attention to detail…each of the blooms is perfect. 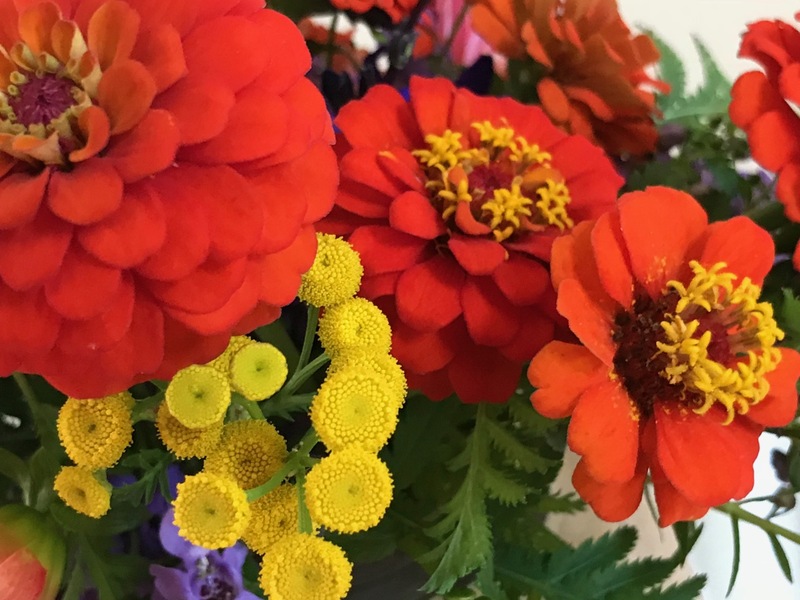 The tansy is just the right colour to highlight the zinnias…well done. Thanks Noelle. I seldom see anyone else use Tansy, but it was given to me years ago by a work colleague and it comes in handy sometimes. Very aggressive though. It looks great in both containers and I love the intensely blue salvia against the orange zinnias. A perfect celebration of summer. 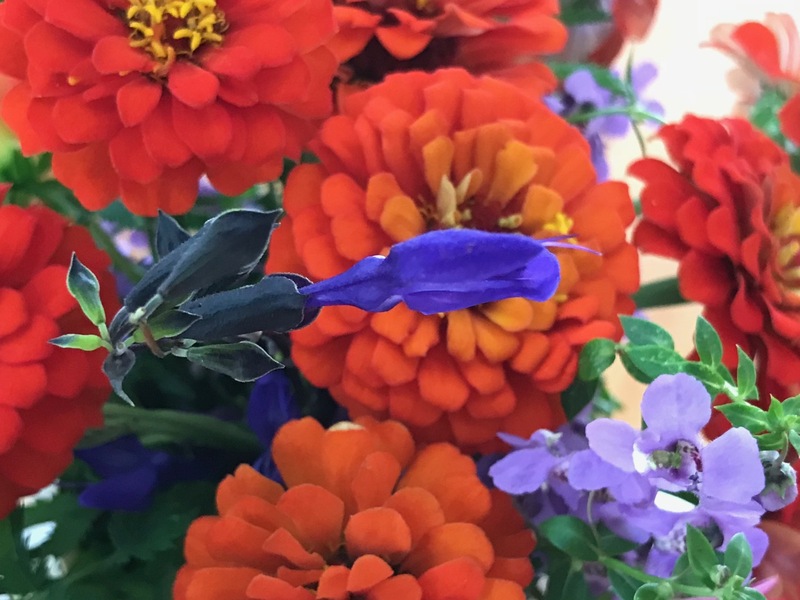 Peter, the blue salvia is one of my favorites and in deep summer orange beckons. I have some similar raku containers from the past as well. And I do remember when $5 was a big splurge. Though I like the crispness of the first bouquet those dangling purple sprays really make a beautiful bouquet. The second arrangement is as if it let its hair down! I love this arrangement – from all angles! 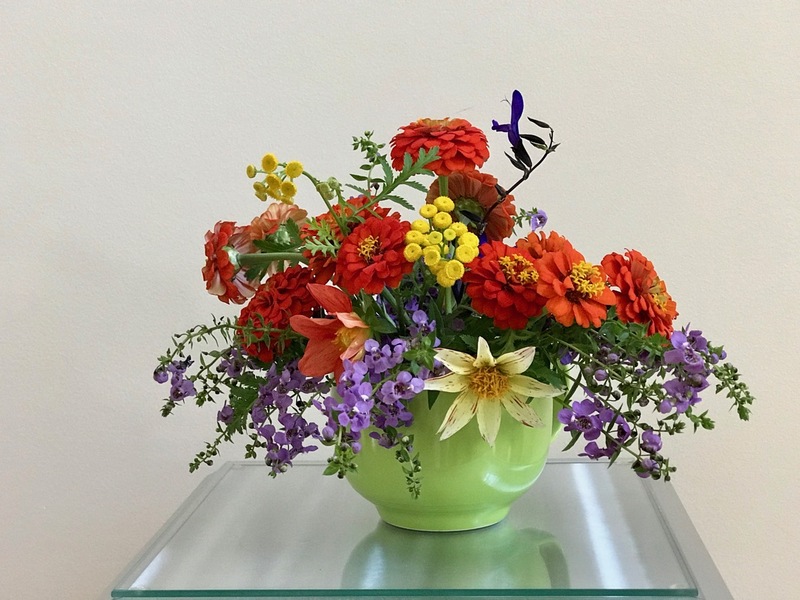 The strong orange of the zinnias mixes so well with the purple Angelonia. Although I lean in the direction of complementary colors, you have me wondering what I could pair with my blue or purple lisianthus to create a smashing contrast like the one you’ve achieved. Glad you liked this Kris. I’ve always had a thing for orangey colors in summer. Anything paired with your lisianthus is going to be a hit with me. I love those vases. 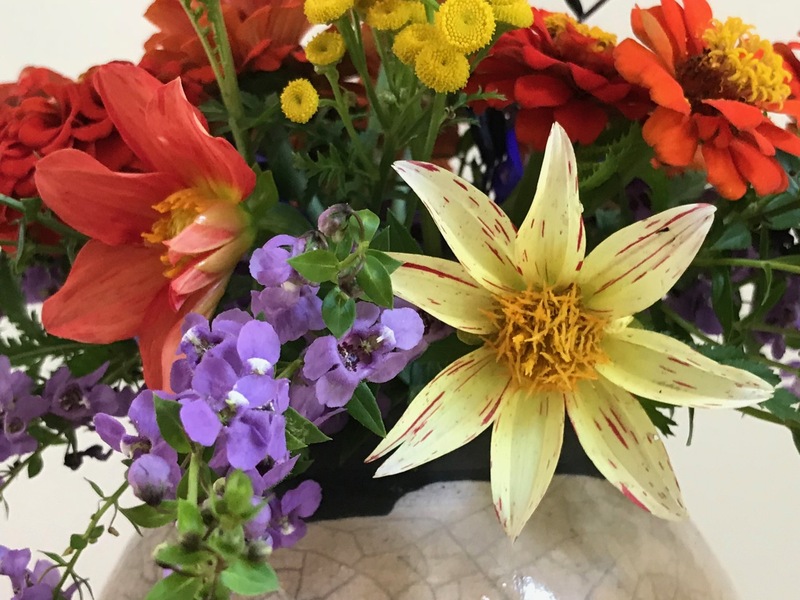 And many of us seem to have zinnias in our posies this week. I saw rows of new zinnias at Mr Fothergills trial grounds last week. One to look out for is Queeny Lime Orange. So pretty. Queeny Lime Orange sounds intriguing. Will look forward to seeing it. 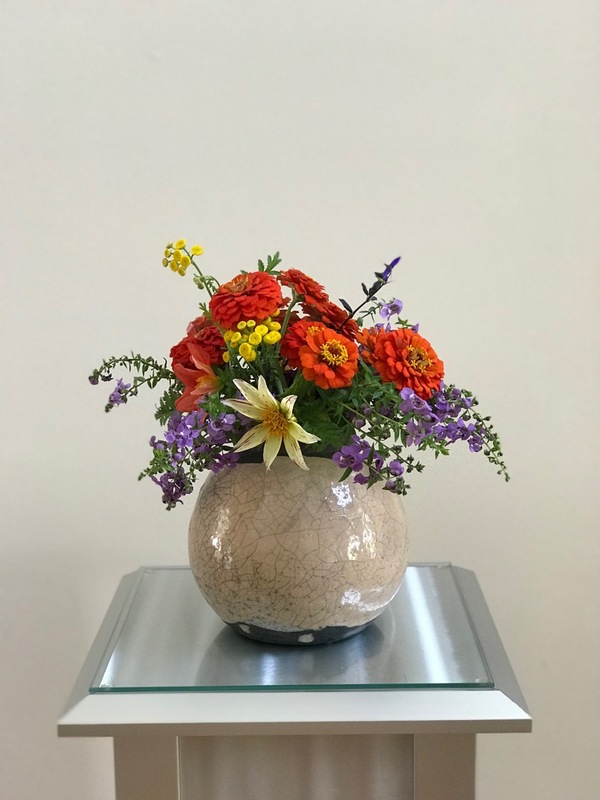 Love the color combination with the vase.I have the same Angelonia, it took a break and just started flowering again. Isn’t the Angelonia just the best? Interesting that it does well even in your tropical conditions, albeit with a little break. Both vases are gorgeous especially with that zinnia taking center stage! Thanks Donna, and so nice to hear from you! Is the opening of the second vase wider? The arrangement seems to have relaxed and spread out in a very pleasing manner. Yes, that second one is shallower and wider so I was able to tuck down some stems that were pretty short. Haven’t seen any posts from you in a while. Hope all is well. 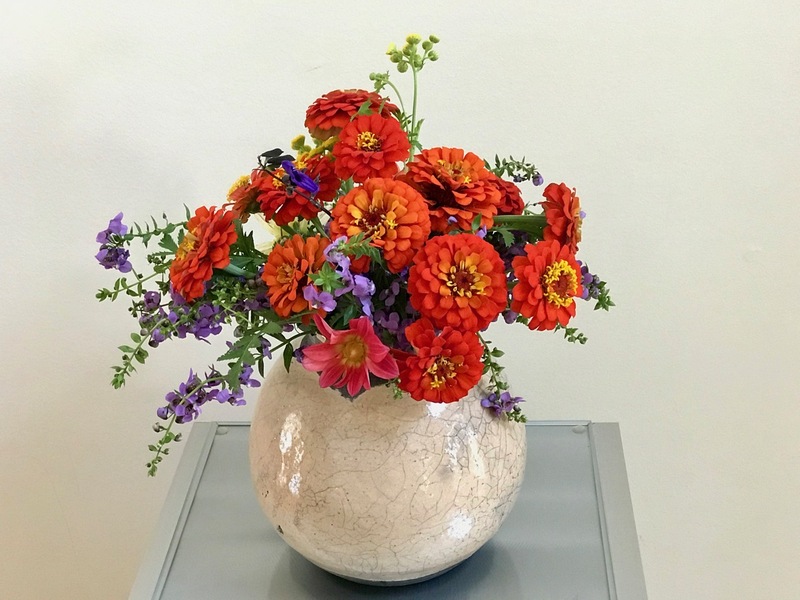 Zinnias are one of my favorite summer flowers – simply lovely arrangements, Susie! Glad you like them Eliza. Zinnias are hard-working and carry my garden through the summer. Very, very nice! I really like the Angelonia/Zinnia combination. I have used that combo several times, too. 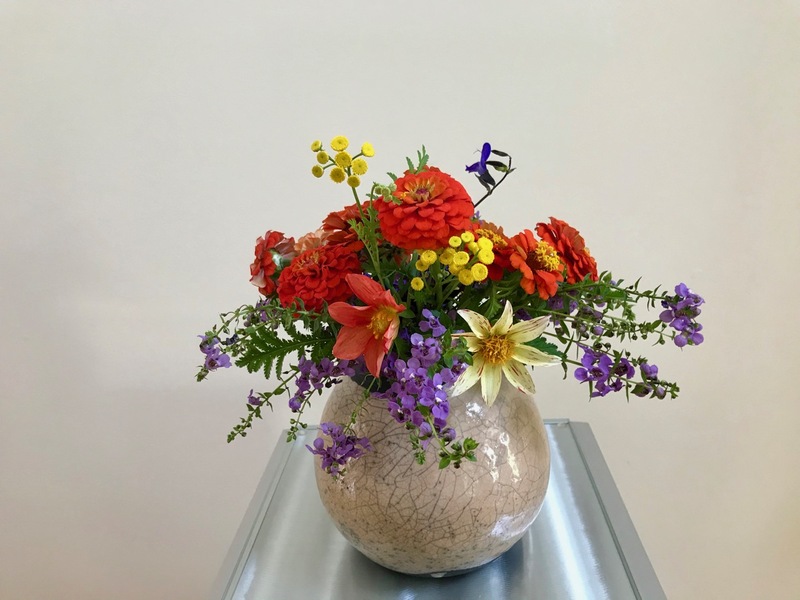 The ways you’ve arranged them–in both vases–are lovely. Thanks Beth. I’m so pleased with Angelonia and the zinnias this summer. Enjoy yours! I think the flowers are more impressive than the vases are. I really dig the black and blue salvia, but am I looking at it right? I see only one tiny bit of it. Yes, just one stem of the salvia. These flowers are holding up well. Delightful! You know I can’t resist orange and blue.